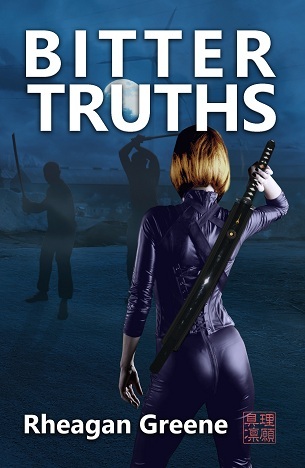 Bitter Truths, the first volume of The Samurai Revival Trilogy, set a few years into the future. Tessa and Penny have a deep friendship and both manage substantial international businesses. However, they have conflicting views of the new peacekeeping initiative. Penny is an enthusiastic supporter, while Tessa is more sceptical. As Tessa’s company is due to be sold for a considerable profit, Penny’s experiences a mysterious and significant downturn. The situation quickly worsens and her bank starts to exert pressure. Then she discovers that her business difficulties are not the result of normal trading problems. She confides in her friend who mounts a daring rescue. But triumph quickly becomes despair when tragedy strikes and Tessa's life plans are thrown into complete disarray. Determined to find justice no matter what it takes, Tessa unwittingly embarks on a remarkable personal journey. However, Penny, recognising her sceptical friend’s super-fast reflexes and athletic ability as the hallmarks of a born sword-fighter, commissions for her a very special weapon. For centuries, the Amakuni family have been forging the world’s best blades in a secret valley near Iga Ueno, Japan. On getting the sword, Tessa feels honour bound to enrol for lessons in using it, even though the thought of killing is repugnant to her. However, although a reluctant convert to sword fighting, to her immense surprise, she finds she enjoys mastering sword technique and is a remarkably gifted fighter, though she has no intention of ever taking her skill outside the practice room. But her natural affinity with the blade has not gone unnoticed. With motives of his own, her sensei suggests further training. So, armed with a blade that can shear through others, she goes to Japan to perfect her sword-fighting abilities with another teacher, the legendary Matsumoto. The training, which passes in an odd, dream-like interlude, proves brutal but effective. Tessa returns to London with abilities now vastly exceeding her wildest expectations. However, she continues to struggle to discover who was behind the terrible injustice she and her friend have suffered, and senses the investigators she retained are not being entirely honest with her. Eventually, she forces them to tell her who was responsible. She confronts the gang and is soon embroiled in a brutal battle. During her bloody baptism Tessa discovers that she can kill – when the cause is a just one. With her natural ability honed by Matsumoto’s patient tutoring she appears unbeatable. Before the last of her opponents dies, she bequeaths her sword to Tessa. It is a second notable blade, forged by the disgraced Amafuji family, the Amakuni's age-old rivals… another in a long string of curious echoes of a feud which spans the centuries. Then, despite her protestations, in order to protect her from legal repercussions after the Calver Cats massacre, Tessa is obliged to become a full-time International Peacekeeper. Nevertheless, her search for the truth continues to draw her towards the heart of a criminal conspiracy with a deadly opponent concealed at its centre. At a public event in London’s Guild Hall, Tessa finally stumbles across the true identity of the gang’s leader. With him detained, she hopes to be able to give up the sword, preferring to concentrate on her developing her private life. However, while awaiting their court appearance, the gang leader manage to escape, swearing publicly to exact revenge on Tessa. After a security operative is killed while protecting her, Tessa realises she has no choice but to pursue her strange, unwelcome destiny with the sword and agrees to return to Japan for further training. © 2006 Mood Music (MdMsc) recommendations are included in some electronic versions of these novels to provide a further means of experiencing the story and enhancing the reader's enjoyment.